I hear ringin’ and I don’t think it’s an angel getting its wings. No, I am pretty sure this particular ringing in my ears is the aftermath of an evening spent with horror-punk progenitors the Misfits. 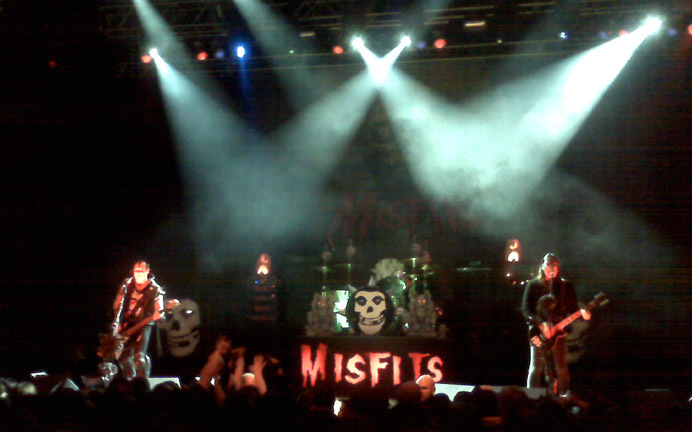 I had my misgivings about attending this show – 11/28 at Houston’s House of Blues – because the Misfits have only one original member from the band’s heyday in the 1980s. Bassist Jerry Only is that original member, and I wasn’t quite sure how these boys would sound without the guidance of one Glenn Danzig, the mastermind behind the original Misfits. 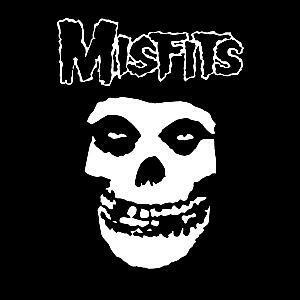 But not to worry – only a punk purist would quibble with the current Misfits lineup, which rocked through its catalog with a vengeance. And did I say they were loud? Maybe I did, but I just didn’t hear myself say it. Yeah, they were loud and that stoked the crowd into a frenzy; even the mosh pit on the House of Blues’ concrete floor looked a little more, ah, energetic than usual. Now that the Thanksgiving eatin’ is done, you may want to turn your attention to making some chili – particularly if it’s cold in your part of the country. 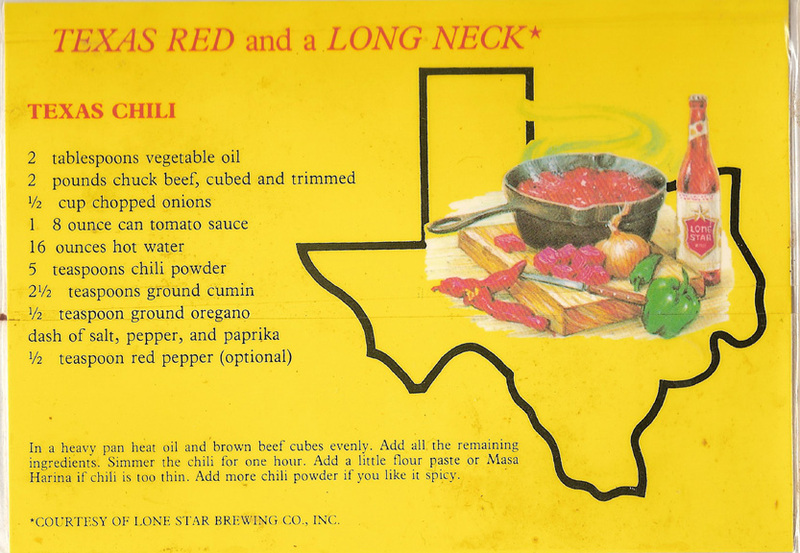 Legend has it that the spicy meat concoction was created by the chili queens of 1880s-era San Antonio who came up with the recipe we still use and enhance to this day. A righteous pot of chili ought to contain some sort of beef, chiles (or chili powder) and tomato sauce if you roll that way. The big argument is whether or not to add beans to chili. Now most enlightened thinkers say no, beans take up space that more meat could better occupy. My in-laws, who live up in New York state, swear up and down that true chili has beans in it but what do they know – they consider grilled weenies real barbecue. I suppose you can put anything you want in chili – including turkey, pork, duck, even beans – but don’t put any of that stuff in mine. Years ago I got this book, A Bowl of Red, by Texas writer Frank X. Tolbert and that’s supposed to be the bible of chili heads nationwide. I kind of think this guy was full of bull (or Lone Star beer) when he wrote this book, because he even sings the praises of chili made at Chasen’s restaurant in Beverly Hills for movie stars, and he talks about how great some brands of canned chili are. Well, I am partial to Wolf Brand in a can – but with no beans! 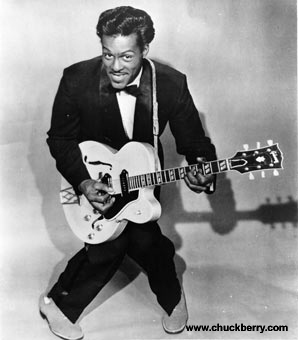 We all know Chuck Berry as that duck-walking, guitar-slinging rocker from the late 1950s-early 1960s, the guy who wrote and recorded classics like “Maybelline,” “Johnny B. Goode,” “Roll Over Beethoven” and many, many more. Berry did all of these for Chess Records, the seminal Chicago blues and rock label that was also home to Muddy Waters and Howlin’ Wolf. But many people know little about Berry’s excursion away from Chess in the late 1960s: by 1966 Chuck wasn’t cranking out top-selling records any more. Berry thought if he left the small Chess label and signed with a bigger label, more money would be spent on getting his records onto the radio and back atop the charts. So in ’66 he signed with Mercury Records, much to Berry’s disappointment. The more corporate label had ideas about making Chuck Berry more “relevant” to audiences starting to dig the crazy sounds coming out of San Francisco. Berry, on the other hand, wanted to make records like he did in the early 1960s. So it was a constant battle for Chuck Berry – with producers, with label bigwigs – and the four years he spent at Mercury were mostly aimless. 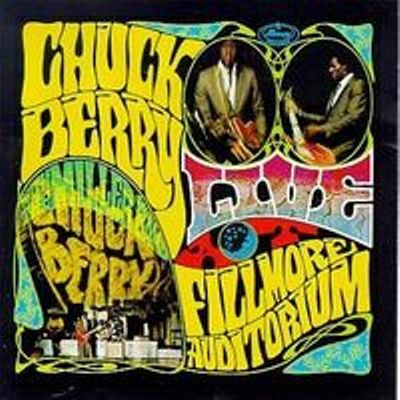 In 1967, Berry released a couple of live albums for Mercury, the second of which was Live at the Fillmore Auditorium. He was backed by the Steve Miller Blues Band, which would later become the Steve Miller Band and earn a number of its own hits in the 1970s. Looking back, this album isn’t bad – it focuses on the slow blues that was popular at the time and which Chuck Berry played in the first place. Sometimes when I go through my sister’s records I honestly cannot understand why she bought (or traded for) some albums. Maybe I’m not giving her enough credit … or maybe she got them by accident. Like the one I got from her room today: Rock Love, by the Steve Miller Band. This one is pretty good! This one came out in 1971, a year before Steve hit the pop charts with “The Joker.” Miller and his band had been around since 1965, when they came out of San Francisco with a pretty generic blues-rock sound. The Steve Miller Band’s first album Children of the Future (1968) came out on Capitol Records, but they actually first appeared on record in 1967, backing Chuck Berry for his Live at the Fillmore LP. Miller was actually making progress up the stairway of success – Your Saving Grace and Number 5, albums from 1969-70, were moderate hits and songs like “Space Cowboy” and “Living In The USA” were getting radio airplay. But in 1971 Miller got into a car accident and broke his neck. During his long recuperation Capitol released Rock Love, an album of live and outtake material. Ray Davies performed “You Really Got Me” on the Late Show with David Letterman on Nov. 18, backed by a full choir. You can hear the studio version of this on The Kinks Choral Collection. This is easily one of the best albums of the year. And check out the drummer on this clip! The Pointer Sisters had an enviable run at the top of the charts in the late 1970s and early 1980s. Their hits included “Neutron Dance” and the most famous cover of Bruce Springsteen’s “Fire.” The albums that all of these songs appeared on were produced by 1970s über-producer Richard Perry. One of the most successful music producers ever, Perry was no stranger to the upper reaches of the charts – he produced the hit albums Ringo (1973) for Ringo Starr, No Secrets (1972) for Carly Simon and many others. 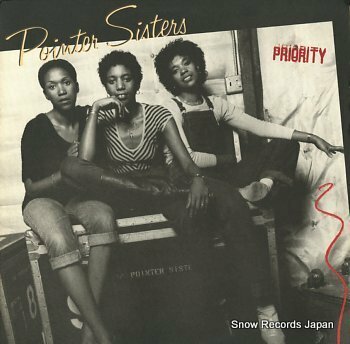 Oddly, one Pointer Sisters album with Perry at the helm made no impression at all – in fact, when Priority was released in 1979, it disappeared virtually without a trace. The sisters were still riding high off the No. 1 smash “Fire” and its album Energy from the previous year when Perry took them into the studio for this followup. UPDATED: With more fine wine toonage, thanks to our readers! My very good friend Randy Fuller has a really cool blog that is not about rock and roll. It’s about wine, but he wrote an excellent piece recently on rock and roll wines. Actually, it’s about good wine in bottles with rock and roll labels – Pink Floyd’s Dark Side of the Moon is there, so are the Rolling Stones, and even a Woodstock poster bottle. As I said, very cool, and you can read it here. I’ve known Randy for many years now, we went to college and high school together and even back then I knew him as a wine connoisseur. My tastes in wine ran mainly toward the red, namely Ripple Red and Thunderbird Red Label. Randy had a more adventurous palate, seeking out the exotic and poetically named Annie Green Springs. You are currently browsing the 30 Days Out blog archives for November, 2009.